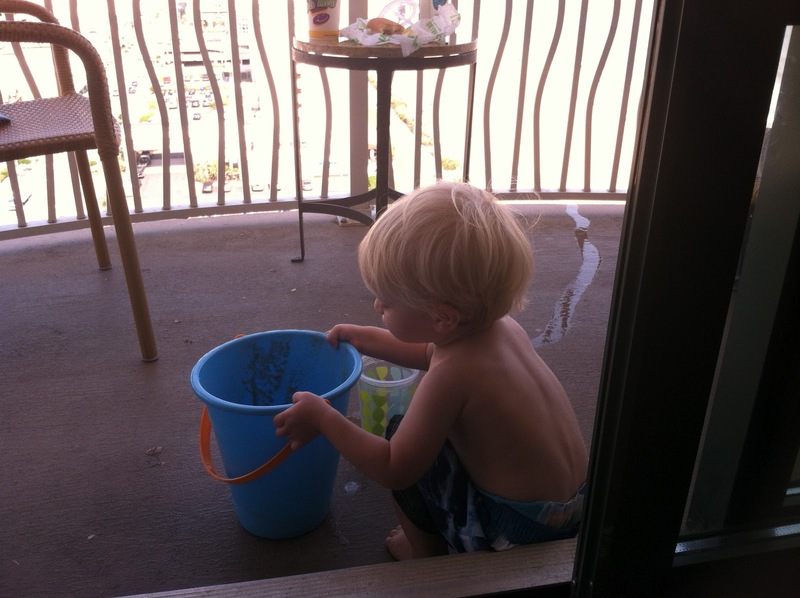 Josh had a conference to attend this weekend at the oceanfront. Since he had a hotel room to himself, compliments of VANA (the professional anesthesia organization in which he participates), he thought it would be really nice if we spent some time together as a family. Free room in a nice hotel with a balcony overlooking the Atlantic? Um ... yes! So Micah and I headed over Friday evening. Micah was so excited to have a refrigerator his size in the room and kept taking stuff out and opening the door, etc. just because he could. We spent the night as a family ... watched the live band from our balcony, spent some time in the pool, stayed up way too late listening to Micah chat about his day. It was really nice. The next morning I awoke to a little boy playing with my hair and stroking my cheek (we slept in the same bed). When I opened my eyes he was still stroking my face and saying, "hi, mommy" in the sweetest voice ever. My heart still melts when I think of that. Josh's conference started really early that morning so Micah and I were on our own. 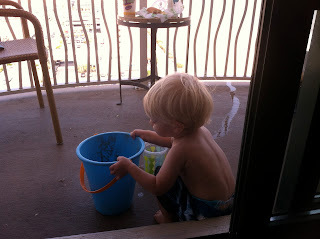 We had breakfast in our room (pb&j ... don't judge) and then headed out to the beach. We weren't there for very long when Micah started asking to go home. He was a bit overwhelmed by the waves and I know he was tired (the live music kept us up until 11) and he is a sucker for his routine. So after about an hour we packed up and headed back to the hotel room. We ate lunch, played on the balcony a little more, and then went home. At some point Saturday afternoon Josh asked if we could arrange overnight childcare and spend the evening together. And so I packed Micah up again for an over-nighter with my family and headed back to the hotel. There was a little VANA party at the rooftop bar of the hotel. When it was over, we walked a few blocks to find some dinner and ended up bringing some yummy pizza back to our room. We just ate and talked and enjoyed each other's company. Even though I was a little sad to leave my boy, I was really grateful to have that time with Josh. But the best part of the whole weekend was Sunday morning. Josh had to wake up early again so I had the morning to myself. At the end of the block was Starbucks, so I walked down there to get some coffee (decaf!) and my favorite sweet treat. Then I settled myself on the balcony and spent an hour alone with my thoughts. God's love for me and His thoughts toward me are more than the grains of sand on the shore. God has cast my sin to the bottom of the ocean floor. I also read my Psalms for the day - I try to read the Psalm that corresponds to that day's date. That morning I read Psalm 23 and saw it in a new light. I prayed. My prayer currently is that I will not be blinded to God's goodness in the midst of my sadness for Evie. I want to recognize the good that He has promised will come from this trial, even if it's not what I expect it to look like. I can't tell you how refreshing that hour was. To be alone with my thoughts and allow the Lord to speak to me without being plagued by the clock and the unemptied dishwasher was quite priceless. I will certainly remember that morning for years to come. All in all it was a great weekend. Thank you for praying for us. I'm with Micah on the love of familiar routine; but truly, when an opprotunity to take a break from routine comes, I do welcome it. It is often in those "come apart" times that the Lord reveals Himself in fresh ways. This time of refreshing was a sweet gift from the Father to you and Josh!